Our concept springs from the centuries-old model of church boy choirs and singing schools. We like that these choirs actively included children, giving them musical training and a formative life experience. We liked that people of all ages were involved in a common endeavor. We are discarding the old, exclusively male model in favor of inclusion of girls and women. We are excited to create such an organization here and now, around an activity in which our entire community is engaged. We are actively seeking singers to start rehearsing this Fall in order to sing for a Lessons and Carols program in December and two or three times at a Sunday morning service. Children ages 8-14 will attend a workshop/rehearsal once a week where they will be given musical training along with a social time and meal including their parents. Adults will rehearse separately at first, before combining with the choristers for full choir rehearsals towards the end of our preparation. The rehearsal and performance times have purposely been left open. 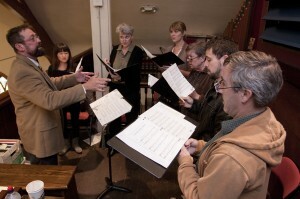 We think it best to find group consensus with all interested singers on which dates and times work best.